Page from a journal handwritten by an unknown person, but likely by a descendant of William Ripley, that lists the deaths at Cornish, New Hampshire from 1826 to 1850. This post covers deaths in 1839. An Infant of I. Smith, Jr.. Child of Ichabod Smith and Sabrina (Luey) Smith, as mentioned on page 329 in History of the Town of Cornish, New Hampshire, with Genealogical Record, 1763-1910, Volume 2. 3 - Mr. Jesse Johnson at Plainfield, 84. 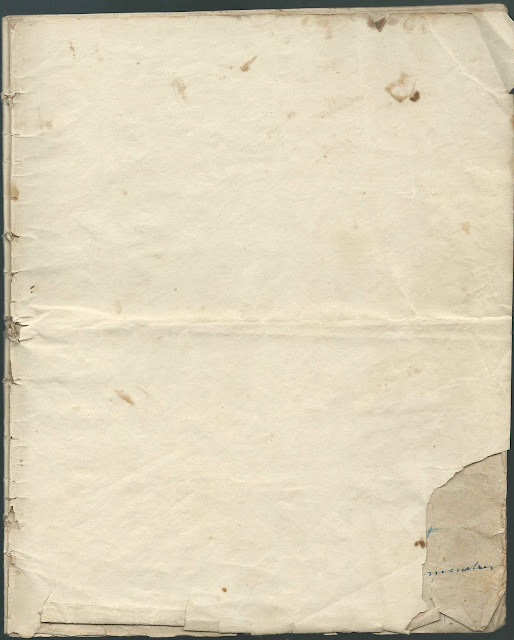 This entry is out of order; appears after the entry of the death of Mr. Benjamin Dow on June 11; presumably because the death happened out of town. His sketch appears on page 235 of History of the Town of Cornish, New Hampshire, with Genealogical Record, 1763-1910, Volume 2. Jesse's Find a Grave memorial shows his death date as April 30, 1839, but his stone, a photograph of which is attached to the memorial, appears to show April 3, 1839; suggestion sent. 26 or 27 - Almina, daughter of David Richardson. She was Mercy Elmina Richardson, daughter of David Richardson and Sarah Goodwin (Ford) Richardson, as mentioned on page 306 of History of the Town of Cornish, New Hampshire, with Genealogical Record, 1763-1910, Volume 2. Mr. Elisha Reed, 85. 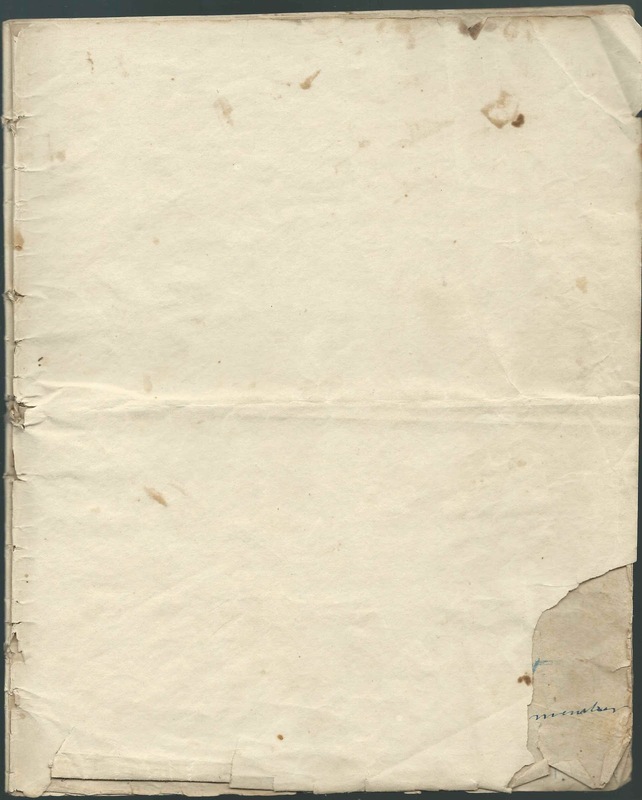 This entry is out of order; appears after the entry of the death of Miss Susan Chase on May 15 or 16. 9 - Miss Mary Spicer, daughter of Bradford Spicer. Mary Spicer was born July 10, 1819 at Richmond, Vermont, daughter of Peter Bradford Spicer and Miriam (Wyman) Spicer, as mentioned on page 345 of History of the Town of Cornish, New Hampshire, with Genealogical Record, 1763-1910, Volume 2. 15 or 16 - Miss Susan Chase, daughter of Clement Chase - 38. Susan Chase, born April 30, 1801, after the death of her younger sister of that name; daughter of Clement Chase and first wife Lucy (Murray) Chase, as mentioned on page 80 of History of the Town of Cornish, New Hampshire, with Genealogical Record, 1763-1910, Volume 2. 23 - Child of Burnham Jacobs. 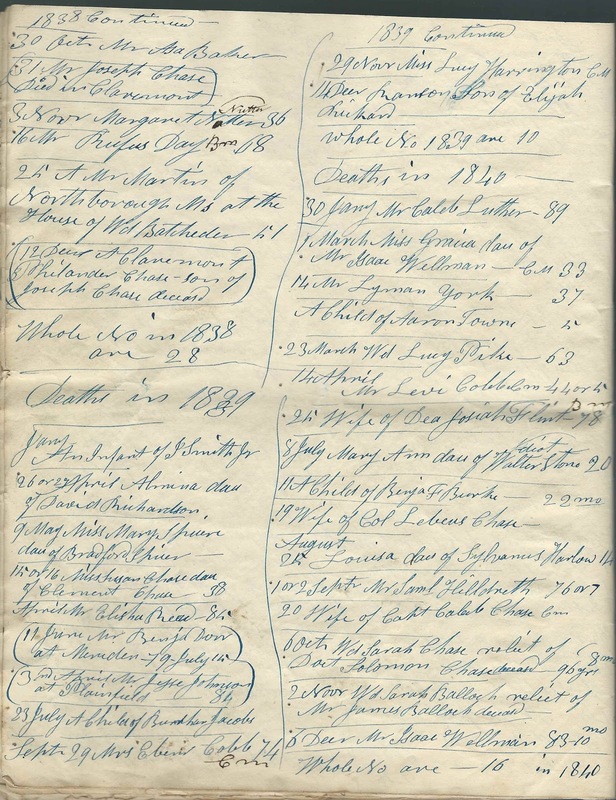 Child of Burnam Jacobs [note spelling] and Eliza (Stearns) Jacobs, as mentioned on pages 228 and 229 of History of the Town of Cornish, New Hampshire, with Genealogical Record, 1763-1910, Volume 2. 29 - Mrs. Ebenezer Cobb, 74, Cm. Mary (Harlow) Porter Cobb - the photograph of her gravestone on her Find a Grave memorial appears to show her given name as Marcey, and the memorial states her death date as September 28, 1839, but the stone appears to read September 29, 1839. She was born September 7, 1865, according to a sketch of her second husband, Ebenezer Cobb, on pages 93 and 94 of History of the Town of Cornish, New Hampshire, with Genealogical Record, 1763-1910, Volume 2. Mary/Marcey's Find a Grave memorial notes that her first husband was Clifford Porter. Miss Lucy Harrington, Cm. Lucy Whitney Harrington, born July 10, 1797 and died November 29, 1830, daughter of Moses Harrington and Abigail (Chase ?) Harrington, as mentioned on page 194 of History of the Town of Cornish, New Hampshire, with Genealogical Record, 1763-1910, Volume 2. Abigail's maiden name is given as Chase on birth records of her children and on her Find a Grave memorial. 14 - Ransom, son of Elijah Rickard. Ransom Rickard, born November 3, 1811, son of Elijah Rickard and his second wife Tenty (Ransom ?) Rickard, as mentioned on page 313 of History of the Town of Cornish, New Hampshire, with Genealogical Record, 1763-1910, Volume 2. Both the book and Ransom's Find a Grave memorial give his death date as December 13, 1839.